We all know that graphical or image representation of any data is really easy and quick way to understand. Data visualization is nothing but a way to represent the raw data in a format which is easy to understand such as pictorial or we can say graphical representation. So lets learn what is this data visualizations and its advantages. Any type of data which is represented by a visualization allows users to compare the data, generate analytic reports, understand patterns and thus helps them to take the decision. Data Visualizations can also be interactive so that users can also drill into the pie, bar etc charts to analyze specific data. These are nothing but simple data filters which gets activated and change the complete visualization to render the selected data. Let's take an example of any E-commerce website and it's raw(text base) sale report. If we have text/excel formatted sale report and if we need to find following points then imagine how difficult it will be. If we get the graphical representation of same text based sale data then it will be super easy for us to find the answers of above questions and much more. This is the basic behind Data Visualizations. Check below visualization created using Line chart. 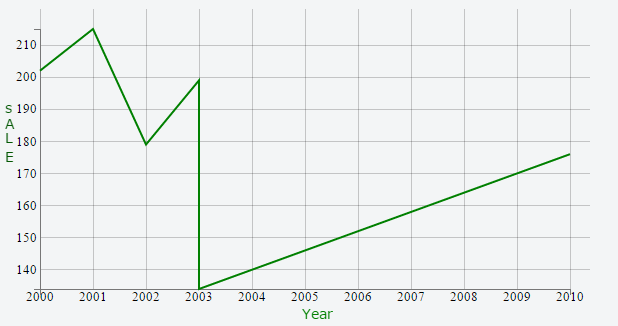 This chart is representing the sale records of 11 years. With the similar approach, we can also check the data per month. The whole idea is to understand how the pictorial representation helps us to analyze the data quickly. Presentation of data in graphical format. High-level understanding of all kinds of data. Understand patterns which is not possible without data visualizations. More analytics data can be collected by end user in shorter time.